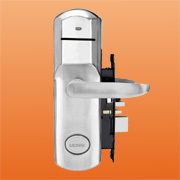 Locstar Technology Company has issued a keyless door lock that works with a Siemens SLE-4442 smart card (Model LS-8008-IC-BG). Suitable for hotels and offices, the CE-certified product is made of stainless steel. It has a 32-byte password protection system. The static consumption is 5A, while the dynamic consumption is between 200 and 300mA. The models antistatic ability is 15,000V. Products are being exported to the US, Europe, Africa, Asia and Australia.